Several hundred images taken with Hubble Space Telescope have been woven together into a rich tapestry of at least 50,000 galaxies. The Hubble view is yielding new clues about the universe's youth, from its "pre-teen" years to young adulthood. The snowstorm of galaxies in the Hubble panorama does not appear evenly spread out. 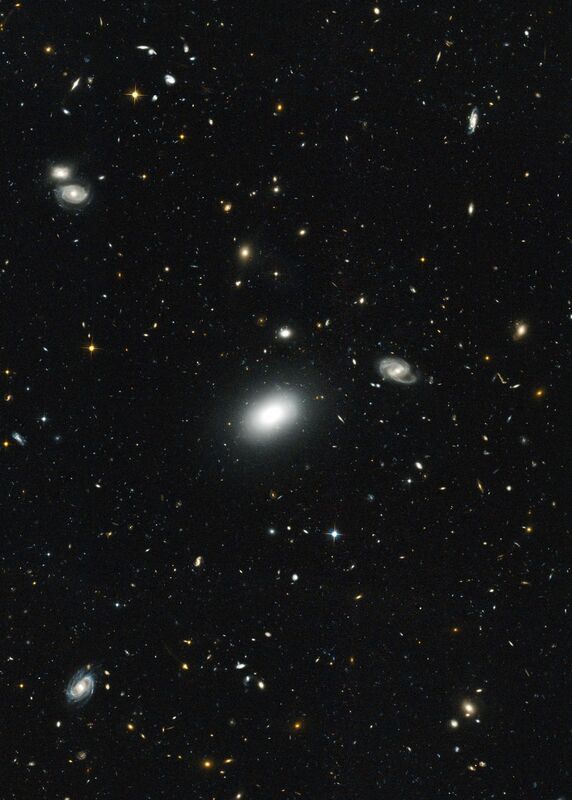 Some galaxies seem to be grouped together. Others are scattered through space. This uneven distribution of galaxies traces the concentration of dark matter, an invisible web-like structure stretching throughout space. Galaxies form in areas rich in dark matter. Among the discoveries so far in this galactic tapestry are a giant red galaxy with two black holes at its core; several new gravitational lenses, galaxies whose gravity bends the light from background galaxies into multiple images; and a rogues' gallery of weird galaxies that should keep astronomers busy for a long time trying to explain them. Hubble's wide view, achieved by weaving together many separate exposures into a mosaic, still only covers a comparatively small slice of sky. The entire width of the image, in angular size, is no bigger on the sky than the apparent width of your finger held at arm's length. To astronomers, however, this seemingly small area is a big piece of celestial real estate. To cover even this much of the sky, Hubble's Advanced Camera for Surveys snapped more than 500 separate exposures, at 63 different pointings, spread out over the course of one year. The final mosaic is 21 images long by 3 images tall. (The dimensions in degrees are about 1.1 by 0.15 degrees. For comparison, the Moon is about 0.5 degrees in angular size). "These images reveal a wealth of galaxies at many stages of their evolution through cosmic time," said astronomer Anton Koekemoer of the Space Telescope Science Institute in Baltimore, Md., who combined all the Hubble observations to create the final panoramic image, which contains over 3 billion pixels. The Hubble observation is part of a larger project to study galaxies in a moderately small area of sky, which provides a representative sample of the universe. The study, called the All-wavelength Extended Groth Strip International Survey (AEGIS), utilized four orbiting telescopes and four ground-based telescopes. The five-year project involved the cooperation of more than 50 researchers from around the world observing the same small region of sky in the radio, infrared, visible, ultraviolet, and X-ray regions of the electromagnetic spectrum. The Extended Groth Strip is named for Princeton University physicist Edward Groth. The project is jointly led by Sandra Faber, professor of physics and astronomy at the University of California at Santa Cruz, and Marc Davis, professor of astronomy at the University of California at Berkeley. "The goal was to study the universe as it was when it was about half as old as it is at present, or about 8 billion years ago, a time when youthful galaxies undergoing active formation were becoming quieter mature adults," said Davis. The Hubble telescope images reveal a time when galaxies were starting to reach their mature shapes, looking like the nearby galaxies we see today. A wide diversity of galaxies can be seen throughout the images. Some are beautiful spirals or massive elliptical galaxies like those seen in the nearby universe, but others look like random assemblages of material, the leftovers from violent mergers of young galaxies. These resemble some of the most distant, youngest galaxies observed, AEGIS team members said. Hubble may have spied tens of thousands of galaxies, many of them odd and chaotic, but other telescopes observing at wavelengths other than the visible over wider areas have pinpointed more extreme and exotic objects, including supermassive black holes and energetic starburst galaxies.